SystemTable is a suspicious application that could enter the system via bundled software installers. Soon after its installation, the user may start seeing unreliable advertisements from unknown sources. According to our researchers, such material might be inserted while the user is surfing the Internet. Because of this, the program falls under the classification of adware. Naturally, if it is too annoying, we would advise you to erase SystemTable with no hesitation. In fact, we recommend doing so for safety reasons also since there is a possibility some of the adware’s displayed advertising material could be potentially dangerous and interaction with it might put the system at risk. As usual, to help users get rid of the unwanted application as fast as possible, our researchers prepared deletion instructions for manual removal; you can find them at the end of this page. As explained at the beginning of the article SystemTable might be spread through bundled software installers. To be more precise, our researchers believe the adware could be bundled with similar unreliable applications, for example, potentially unwanted programs, browser hijackers, and so on. Provided, you do not wish to receive such doubtful software ever again we would recommend paying more attention to the reliability of the programs you choose to install and pick legitimate sources to download them too. Besides, it would be a good idea to pick advanced installation settings whenever there is such a possibility because in some situations users can deselect unwanted suggestions if they select custom installation. Another extra precaution you may want to consider is acquiring a reliable antimalware tool as; it can alert you when you are about to interact with possibly malicious material or stop threats from entering the system. 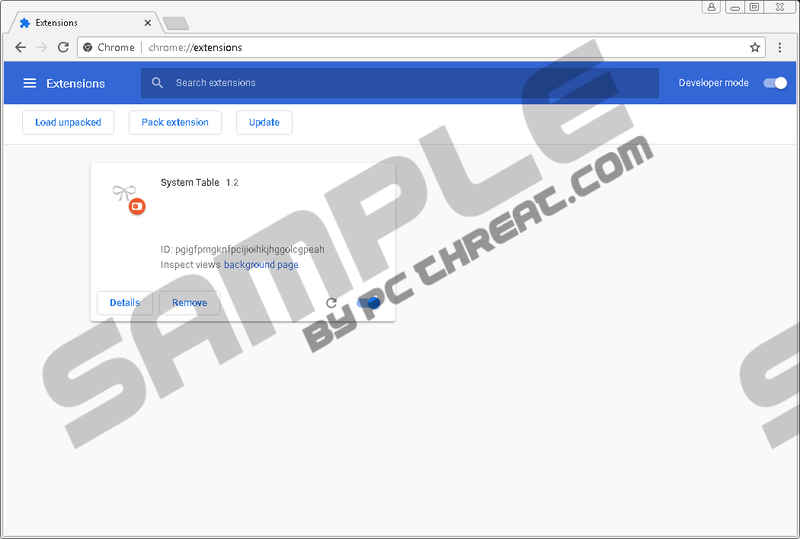 During the installation, SystemTable should create four folders titled SystemTable too in four different directories located in the %LOCALAPPDATA% and %USERPROFILE% directories (we will list exact paths in the instructions found below the article). Later on, the adware might start injecting the user’s default browser with various advertising content from the software’s third-party partners. The bad news is this advertising material could originate from anywhere, which means some of the ads could come from possibly malicious web pages too, for example, sites with adult content, gambling websites, scam pages, etc. As you might be aware of, visiting such websites may put your system or privacy at risk as they might contain dangerous threats or could ask you to provide sensitive information. This is why it seems to us SystemTable should be removed with no hesitation the moment you realize it is on your computer. After all, the software does not do anything else besides showing annoying advertising content and so leaving it unattended might simply disturb your browsing. It looks like currently, the adware works only on Google Chrome browsers, which means it should not be encounter by those who surf the Internet with Internet Explorer, Mozilla Firefox, and so on. The instructions we will place at the end of this article will explain how to remove SystemTable step by step, so if you have no idea where to start, you should simply slide below and follow the given instructions. Needless to say, users who prefer deleting the adware with automatic features could scan the system with a reliable antimalware tool instead. In fact, we highly recommend scanning the system even if you eliminate SystemTable manually just to find out whether there are no other threats on the computer. Given the application might be distributed with other unreliable tools it would not surprise us if during the scan there would be more detections. To delete all identified untrustworthy programs, users should simply press the antimalware tool’s provided removal button. Lastly, users who have more questions about the adware could leave us messages at the end of this text. Find folders titled SystemTable, right-click them one by one and press Delete. Quick & tested solution for SystemTable removal.